Sam can be heard on CFRO 100.5 Vancouver Coop Radio as the support act for Guy MacPherson on What’s So Funny? (long, long running comedy interview radio show - it's awesome). This is also a podcast. Sam’s on a podcast. This is a monthly show at the Wallflower Diner on every second Thursday! Simon King and Sam bring top-tier talent to the stage. It’s a blast! Vancouver's best live comedy talk show hosted by Brett Martin! Sam's his hapless sidekick. Yuk Yuk's Vancouver! Check it out here! The longest running comedian interview show and podcast there is! Hosted by Guy MacPherson. Sam chimes in. 11:00PM on CFRO 100.5FM. Like the show on Facebook and look for past shows and everything Guy on the website. 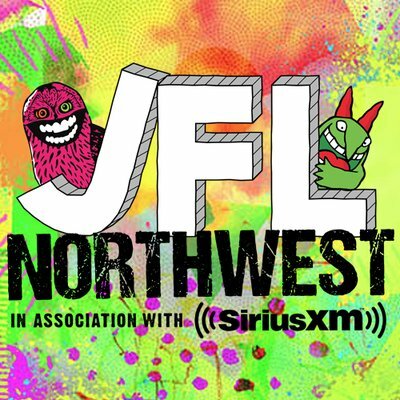 The show was nominated for a JFL Northwest Comedy Award! Funny people singing funny songs! Musical Jokes showcases Vancouver’s finest and funniest musical comedians in one of the city’s best comedy venues. Check out Musical Jokes on Facebook for upcoming show info! This show at Yuk Yuk’s features some of Vancouver’s finest filthy comedians telling jokes. It’s pretty straightforward. Imagine the jokes you tell with your good friends, but instead of you, it’s us comics, and instead of your friends, it’s them and more.